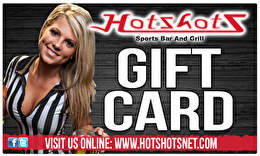 Hotshots Sports Bar & Grill is the perfect place to meet with friends and enjoy great food and cold beer. All Hotshots locations feature a large array of HD big screen TV's making us the destination for everyone from the casual sports fan to the die-hard fanatic! Pool tables, dart boards, and a host of other interactive games and nightly promotions make Hotshots a great place to go to unwind and let loose after work for a one of a kind experience. Happy Hour at Hotshots is from 3 p.m.-6p.m. and features great deals on food and drink to help you unwind after work. The fun continues on well into the night at Hotshots. If you are hungry, we feature daily lunch specials and a full menu of over 60 items available 7 days a week. Come visit one of our great Hotshots locations and you will see that it is the quality of service and fun atmosphere that sets Hotshots apart from all the rest. Large groups are welcome! 1239 S. Laclede Station Rd. For balance inquiries call the phone number to a Hotshots Sports Bar And Grill's location below.